Winter, at least in snowy regions, can bring a monochrome look to the world, making a splash of colour stand out that much more. 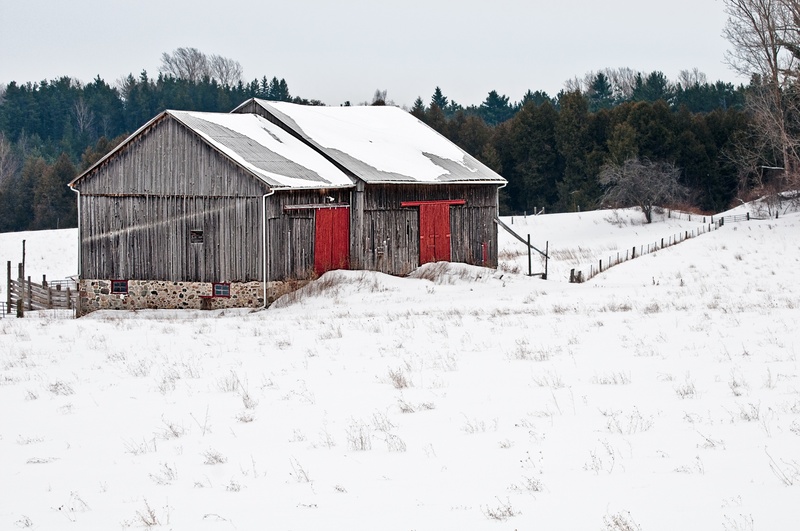 I was hiking through an area known as Mono Mills when I came across this barn with very colourful red doors. Couldn’t resist, despite the deep snow and the cold weather. Molly the Doodle, who loves the snow and to go hiking was thrilled with the little “off-trail” side trip to get a better angle. Pictures like this remind me why I like walking with my camera, particularly in areas that are new to me. You never know what is around the next corner. This entry was posted in Nature, Travel Photography and tagged Hiking, nature photography, outdoor photography, photography, Techniques and Styles, travel photography, winter photography. Bookmark the permalink. Thanks. Getting into a good position to take the photo was challenging as getting off the trail meant wading through knee-high snow. Worth it, though.